Throughout the summer months I seem to crave ice cream. Maybe it’s childhood memories of chocolate and strawberry cones from Carl’s, the best soft-serve ice cream shop ever. Or maybe it’s the fact that it’s blazing hot outside and I need something to cool down. Either way, I could eat ice cream every day. 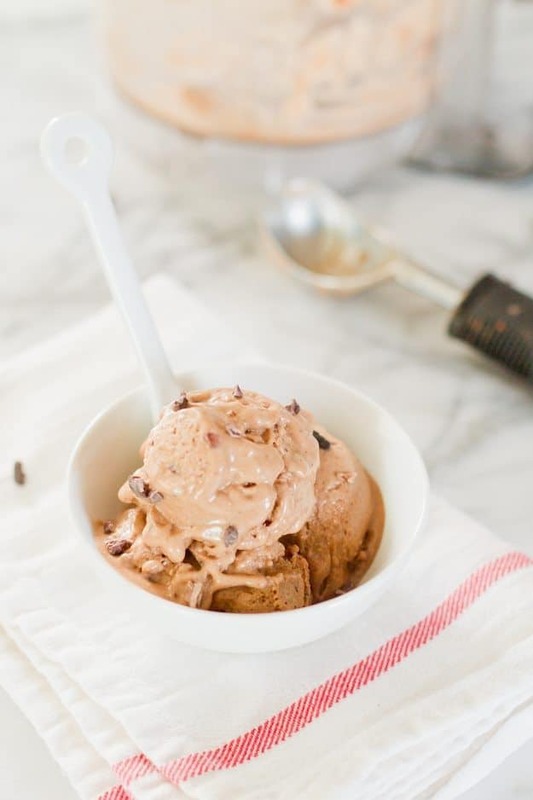 It’s always been my favorite dessert so when I found out you could make healthy ice cream from ONE ingredient (frozen bananas) I was in heaven. I actually have to thank my mother-in-law for the idea because she was the first person to introduce me to it. This was years ago — way before the land of Pinterest. Now everyone knows about frozen banana ice cream, which is awesome!! I’m just waiting for someone to open a shop with healthy fruit-based ice creams here in Richmond. Anyhow, this summer I’ve been on a banana ice cream bender… again. I’ve been making a bunch of different combos and have found a new favorite. We all know banana and chocolate go well together, but you introduce a little almond butter to the mix and things get real. 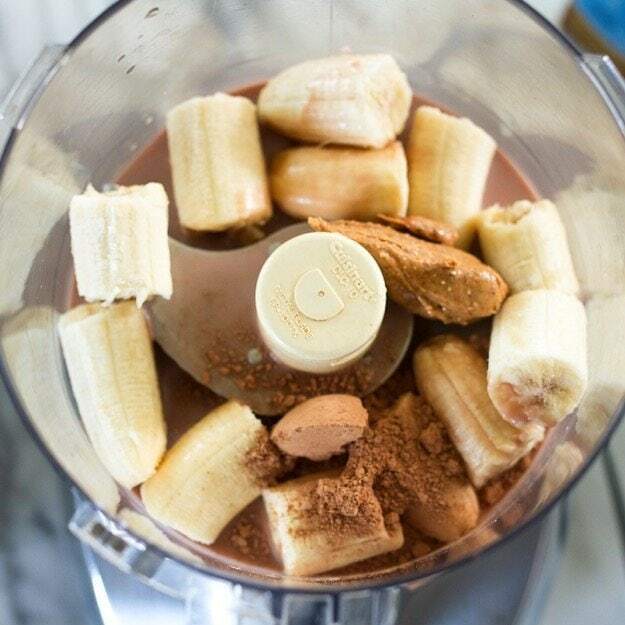 Chocolate, banana and almond butter = the trifecta. I used cacao powder and unsweetened chocolate almondmilk to get a chocolatey flavor without any added sugar and it worked like a charm! See how smooth and creamy it turns out?!? I added in a few cacao nibs for a little crunch, but they’re totally optional. Isaac hates crunchy things like nuts and chocolate chips in his ice cream (or brownies) so I get that some people won’t be a fan. 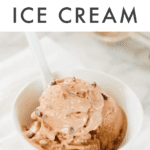 Nibs or no nibs, this healthy ice cream is soooo good and incredibly easy to make! Ready for the recipe? 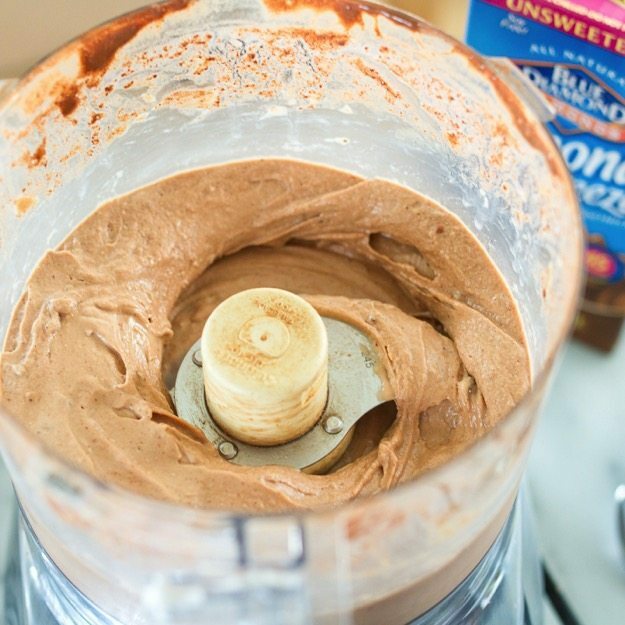 If you make this Healthy Chocolate Banana Ice Cream be sure to leave a comment and star rating below letting us know how it turned out. 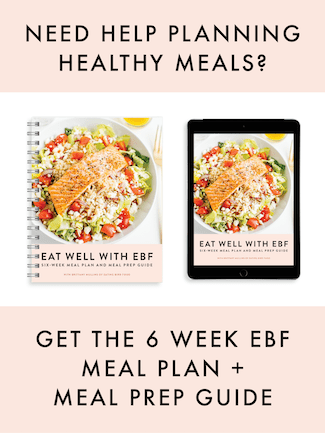 Your feedback is so helpful for the EBF team and our readers! 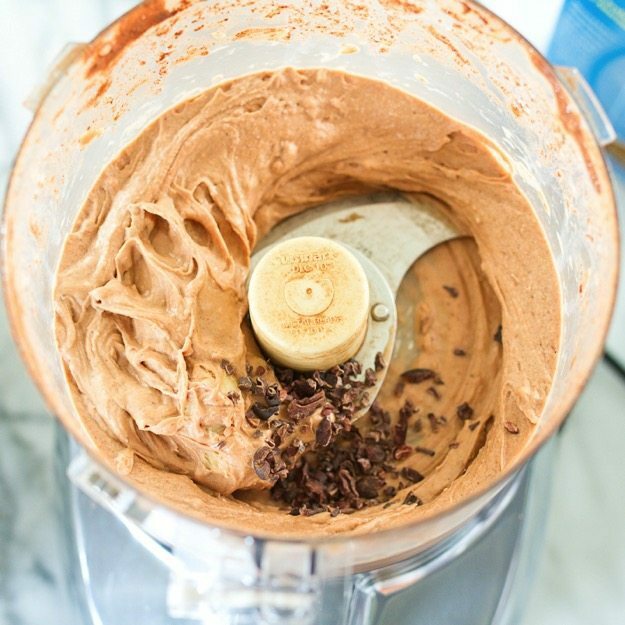 Place bananas, almond milk, almond butter and cocoa powder into a food processor. Pulse/process until smooth and creamy. You may need to turn off the motor and stir the mixture a couple times while processing. Add in cacao nibs or chocolate chips (if using) and pulse once more. 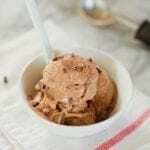 Scoop/spoon ice cream in to a bowl and enjoy! *You can use regular almond milk too. You might just need to add more cocoa powder to get the chocolate flavor! 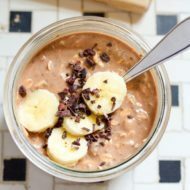 You keep telling me to make this, and I have no excuse now that I have a ton of frozen bananas in the freezer… Now I need to get my hands on some unsweetened chocolate almond milk (which, what the heck… I’ve never bought either.. I’m thinking it wasn’t available until recently?)! I always crave ice ceam in the summer. My new fave is a specialty ice cream shop in Austin called Lick. It’s fabulous. But I like making my own treats too. Thanks for the recipe! Oh yum! I visited Austin a few years ago (and had amazing food!) but I don’t think we went to Lick. I didn’t even know the unsweetened chocolate almond milk was a thing! I will def have to try this. I just bought the unsweetened chocolate for the first time last week. I didn’t think I would love it but I did. I will absolutely have to put some into my cold brew! Great idea!! I make banana ice cream all the time in the summer too. Chocolate almond milk would be an awesome addition to this and coffee! Thanks for the idea. We just moved and I can’t find my food processor blades. Of all the things to lose! I’m about thisclose to ordering new ones. Ohh I’ve made chocolate banana ice cream but I haven’t actually tried it with the chocolate almond milk! Definitely trying this soon! My favourite! 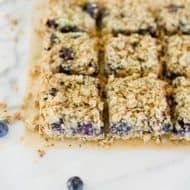 I also love adding a cheeky spoon of crunchy peanut butter in there! As soon as our food processor arrives I am making this! Holy YUM!! How are you surviving without your food processor??? I grew up on Carl’s as well, and have many fond memories attached to it. I took my brother to Carl’s yesterday for Father’s Day (he now lives in Richmond). Unfortunately, I have developed a bad reaction to cow’s milk, so I paid the price for my scoop of strawberry creaminess. But finding this dairy free version of creamy deliciousness is making my mouth water. Thanks! This sounds utterly delicious! Will definitely have to make some! This is some smart nice cream! Almond butter?! I’m sure it makes it extra creamy… thanks so much for this, it is pinned and getting made!! Yay! Hope you like it, Alison. Looks amazing! How long can you keep this in the freezer for? Thanks Daniela! It tastes the best when served right away, but I’m sure you could store it in the freezer for a few weeks. It does tend to get really hard when frozen so you’ll need to take it out of the freezer to thaw a bit (like 15 minutes or so) before serving. This looks delicious and I would love to try it. I have evrything other than the chocolate almond breeze but I’m down for a quick grocery store trip. Quick question, can you double check the nutrition on this? The carbs and sugars seem off. 7 g carbs, 47 g sugar? Hi Heather! I hope you love the ice cream!! The nutrition info is confusing, the amount comes after the term so there’s 7 grams of fat, 47 grams of carbs and 24 grams of sugar. I put lines in so it’s easier to tell which number goes with which! YES, absolutely YES. I love adding chocolate protein powder in my banana ice cream to add some more protein and thickness too! This is amazingly delicious!!! I actually used chocolate cashew milk instead of almond…..soooooo delicious! I also sprinkled some wheat germ on top …..even better! OMG!!! I was looking for a low cal sweet treat. This was so good! I’ll make it over and over again! Oh yay!! I’m so glad you liked it, Tina!! Enjoy. What if I don’t find Almond milk and almond butter…..can I substitute with normal milk and butter ? Hi Maya! 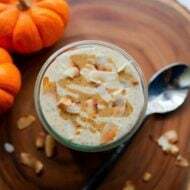 You can use regular milk and another nut butter like peanut butter in place of the almond butter. Yay! So glad that you like it, Sandy. Enjoy. This was so good. My husband and I enjoyed this with our evening tea. My 8 year old son was eating his Reese’s peanut butter cup ice cream sandwich and tasted ours. Now he wants some next time. Yeah, healthy ice cream snack. Hi! I am really planning to add this on my list for my soon-to-be business 🙂 I hope its okay to use this as part of my food testing and tasting hehehe but i should ask, if i put this in freezer how many days it would last? I’m allergic to almonds and coconut while trying to go Paleo. Any suggestions for this recipe? I’m sure you could use any other kind of nut butter. I’m going to try this with chocolate protein powder/shake instead of the chocolate almond milk. I’m not allergic, but I like the idea of adding a little protein. Love this idea! Let me know how it turns out. …I love this idea….sounds so yummm. However, theres very litle ” almond’ in Almond Milk that you buy, and you can actually make your own. I lived in CA, in the area where there was Blue Diamond Almond Farm and Plant, but I did research on it, and havent used Blue Diamond in a long time…; I am not criticizing, I am only stating an option. I realize the post was in partnership with Blue Diamond, and I respect that,to the end that it helps make your site possible…that is the reason I stated it was not to criticize, only to share information.